connect with your FPMT family. This is to check how life is finishing so fast. The life that you have has a certain number of hours, minutes, seconds, split seconds; it is finishing so fast. During this time how much of one’s life has been used to practice Dharma? How much has been used for the cause of the lower realms, with the heaviest suffering and the longest time, unimaginable time, longer than the duration of suffering in the human realm or the deva realms? How much is virtue and how is much non-virtue? It is good to reflect like this. It is very good to use [an hourglass] for realization of impermanence and death. It makes you do something worthwhile during this time, during this one hour, while the sand grains are dropping. When half the sand grains have dropped, are almost gone, then it is good to reflect how much virtue has been done and how much non-virtue. How much life has been wasted and how much life has been made meaningful. When all the sand grains have dropped, when it is finished, you think, how much of life has been wasted and how much of life has been made meaningful. 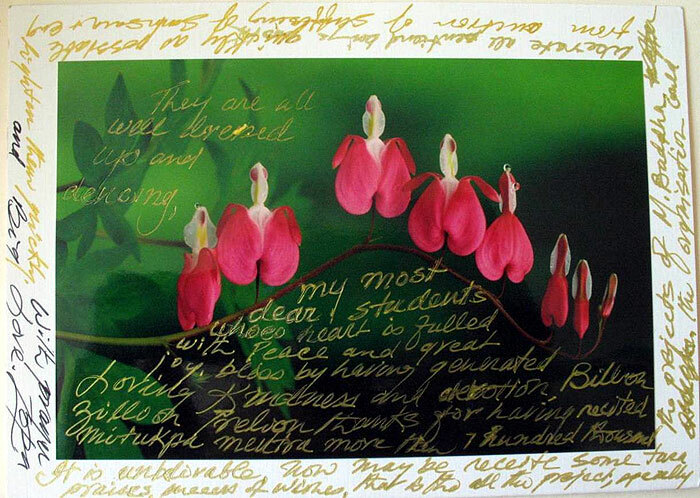 Dictated by Lama Zopa Rinpoche in NYC, April 15, 2009, scribed by Ven. Lobsang Yangchen. Rinpoche suggested that it would be good to attach this commentary to hourglasses and sell them at the centers. Rinpoche thought it would be good to have the sand inside the hourglass rainbow-colored, so when the grains fall it would be layered like a rainbow, not different colored sand grains mixed together. Enjoy brief glimpses of Rinpoche on our streaming videos page, including a link to the streaming videos from the Mani retreat at Institut Vajra Yogini! Rinpoche’s advice to recite “The Dharani Called Possessing the Limbs of All the Buddhas” (posted to the FPMT Yahoo! Group, August 22, 2009) received many appreciative statements on its timeliness. For more inspiration, please enjoy other statements of appreciation! In “Practice and Statue for Rinpoche’s Health,” (FPMT News August 2009), we printed Rinpoche’s thank-you card. We realize that perhaps it was a bit too small to see clearly. Please have another look! In that thank-you card, Rinpoche made the suggestion: “Now maybe recite some Tara Praises for success of wishes that so all the projects, especially the project of Maitreya Buddha, the Organization, could liberate all sentient beings as quickly as possible from ocean of suffering of samsara and enlighten them quickly.” Please accept a copy of the Praises to the 21 Taras with our thanks! FPMT International Office is sorry to say good-bye to Jose Carlos Alarcon who served as the office’s CFO from December 2008 through August 2009. Jose served FPMT previously as director of Nagarjuna C.E.T. Madrid and as president of FPMT Spain for two years. Jose is returning to Europe, where he’ll be closer to his family. We wish him every success and send tremendous thanks for his contributions to the office. All of Rinpoche’s Light of the Path teachings (from the retreat in USA September 8-22) will be made available in a free video-on-demand format. The teachings will be translated into French, Spanish, Italian and Chinese so that you can watch Rinpoche and listen in your own language! As of September 4, you will see an option for “FPMT Media Center” on the Online Learning Center. When you click on the Media Center, videos uploaded daily will be available in a digest playlist. The videos will remain available for several months. We hope you will enjoy and take great advantage of this new wonderful resource. Regardless of whether your center or study group has a guiding teacher, please consider watching the priceless Light of the Path videos as part of your program! A new transcript of Lama Zopa Rinpoche, How to Make Having Children Meaningful, is available. The FPMT Retreat Prayer Book, first launched at the Mani retreat in France (May 2009), has been updated for Light of the Path. For those with prayer books from the Mani retreat, all updates can be found on the FPMT website (in English and Spanish). For those attending Light of the Path without a prayer book, the newest edition will be made available on site in English, Spanish and Chinese. After publishing Heart Advice for Death and Dying, we received the following: “Rinpoche was not happy that his five powers had been edited and the detail about possessions had been taken out. Rinpoche said this is all part of the practice so to take out the suggestions was not OK.” Therefore, we have made a small pamphlet on How to Make Your Possessions Meaningful as an insert for every Heart Advice book that goes out from the Foundation Store. Don’t forget we have this Liberation Card for Dying Person in English, French, Spanish and Chinese! Foundation Training in Rituals being restocked soon. Updated according to the 2009 edition of Essential Buddhist Prayers Vol. 2, it includes all common pujas done at FPMT centers along with teachings on each practice by Lama Zopa Rinpoche. 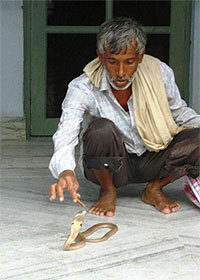 A compendium CD includes the audio files of these practices led by Ven. Sarah Thresher. At CPMT Rinpoche advised that we help each other to keep ethical behavior and take the precepts together. The upcomingDirect and Unmistaken Method, The Practice and Benefits of the Eight Mahayana Precepts contains the Eight Mahayana Precept ceremony, as well as commentary on the benefits of the practice and a very lovely motivation from Rinpoche! A long-awaited translation of the longest Medicine Buddha puja, The Wish-Granting Sovereign: A Ceremony for Worshipping the Seven Sugatas by the Fifth Dalai Lama, a personal request of Rinpoche, is now complete. After final editing, this will be made available as a practice booklet through the Foundation Store. Join in! One comment heard about the CPMT is that “there is no follow-up.” Looking back across the years, if there had not been any follow-up, we wouldn’t be where we are today! But there’s no denying that we should keep in mind the latest CPMT targets and check in regularly on our own progress. International Office will soon be sending out the first of such updates – and your contribution and news are critical to making them meaningful. So, if you have taken any action on the plans and discussions raised at CPMT 2009, please let Doris Low at Center Services know. As promised in the last newsletter, every month we will do a short update on what has been achieved in terms of the goals set at CPMT 2009. One aspect of FPMT culture which was prominently covered at CPMT 2009 is our integrated approach towards spiritual development that gives a balanced importance to study, practice and retreat. On the subject of retreat, at the CPMT Rinpoche had said, “Definitely, there’s no question, it’s very, very useful. Without talking many words, when you do retreat, only at that time you see your mind.” Rinpoche also spoke of his wish to see more guided retreat in the organization, in particular, for retreatants to have an authority to turn to when they encounter difficulties. In the upcoming Light of the Path retreat, Education Services will be working with a core group of FPMT teachers to develop a subject curriculum based on Rinpoche’s teachings, who will be enabled to guide other students, having received Rinpoche’s transmission themselves. Other exciting retreat opportunities are being developed in the FPMT mandala. Vajrapani Institute, for instance, is offering “Turning Inward – Advice on Personal Retreat with Ven. Tenzin Chogkyi” to help people get introduced to the practice of personal retreat (Sept 11 to 13, 2009). Milarepa Center found an extremely simple and economical way for centers to provide additional housing and retreat space, putting up the structure for a “Tiny House” in a cabin-building workshop by Peter King in August 2009. Kalachakra Center acquired a new property for a retreat house at Saint Cosme en Vairais, near Le Mans, which Rinpoche personally blessed when he was in the vicinity. 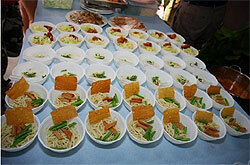 Some of the related photos can be found in this newsletter. Do write to Center Services at International Office if you have any news on retreats to share! According to Dr. Pik Pin Goh, the recently retired director of Kasih Hospice, the idea behind opening a new café on its premises is to provide a place for visitors, workers and volunteers to chill out, and to add to the revenue stream to finance the hospice’s operations. Geshe Tenzin Zopa officiated at the opening, giving blessings and an inspiring talk. The guests were treated to a scrumptious meal which included “Sera Je noodles” and laksa – white rice noodles in fragrant curry soup. Serious business followed with an interactive session among 20 volunteers led by a Buddhist psychiatrist on the handling of SAD (sadness, anger and depression). 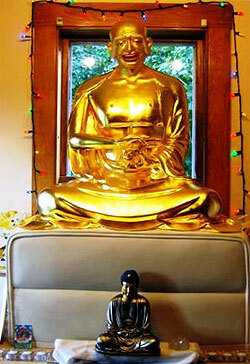 Some years ago, Lama Zopa Rinpoche recommended that Milarepa Center have a statue made of Bakula Arhat. Rinpoche indicated that this particular statue would help to bring wealth to the center, but mainly the flourishing of the Dharma at Milarepa along with success in all of the center’s activities. The statue was created by Lisa Heath, a local artist, in clay and was completed over the past few years and filled and consecrated by Geshe Tsulga, the resident teacher at Kurukulla Center in Boston. Then it sat for quite a while as the center worked to raise money to have it gilded and to find the best artist to do the work. local artists as she was new to the area. Finally Dolores Devellis of Kurukulla Center sent Ven. Amy an e-mail mentioning a wonderful artist, Troy Stafford, from the neighboring state of Maine. Ven. Amy contacted Troy who came out to “visit” Bakula Arhat over the summer. He seemed the perfect person to do the work. He showed up for the Family Camp on a Thursday evening and said it would be completed by the end of the camp three days later. Everyone got involved and it was a wonderful activity for the children to be able to offer gold to Bakula Arhat during their weekend activities. By Sunday night, when everyone left, Milarepa Center glowed with the gold offering to Bakula from Troy, his wife Mer, and all who were at the center during the project. Keep checking for exciting opportunities to offer service in FPMT centers around the world. Many interesting and challenging positions on a paid and volunteer basis are inviting applications from suitable candidates. In Australia, Loving Kindness Peaceful Youth is seeking a new director to take the project forward to its next step – a post that would appeal to anyone with a wish to develop experience in community development and non-profit organizations and projects. Also, Kushi Ling Meditation Center, located in an idyllic setting about 8 km north of Lake Garda in Trentino, Italy, needs a secretary to help in administrative manners. The person should speak and write Italian, the job is part-time 20 to 25 hours a week. The center offers food and lodging and a small salary. Milarepa Center in northeastern Vermont, USA is looking for skilled carpenters/builders for the peak leaf viewing season, September and October, to help finish construction on a new retreat cabin. 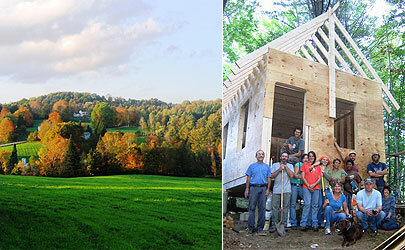 Right: Workers and builders at Tiny House Retreat Cabin at Milarepa Center, Vermont, USA. NB: center details are always most up to date in the directory on the FPMT website. Like molding dough in your hand, you can definitely turn your mind whichever way you want.